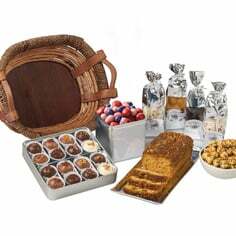 The Royal Gift Basket is a grand gift overflowing with goodness. 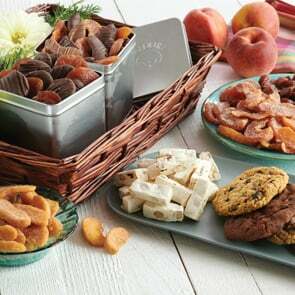 Twelve gifts in one- something for everyone to enjoy in the family, group or office including all natural dried fruit and rich chocolate covered fruit. 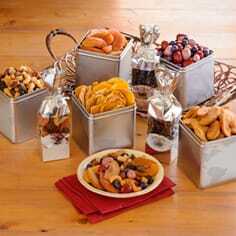 Your thoughtfulness will long be remembered when they receive this gourmet chocolate and fruit gift basket. Beautifully packed in our reusable wooden-handled basket. Find more impressive gourmet gift baskets at Meduri World Delights.